The Battle of Midway marked the high-water mark of the Japanese Navy. 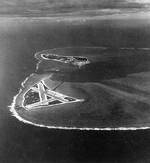 Unfortunately, the confidence and skill that had given them victory after victory in the first six months of the war now led them to commit their forces to an invasion of Midway Island, an unwise over-extension of their defensive perimeter. This might not have proven fatal, had not the operational plan devised by Admiral Isoroku Yamamoto and Combined Fleet staff been needlessly complex, and had not the Americans possessed the radio and cryptographic intelligence assets that they did. However, as the result of these factors (and some breathtakingly effective repair efforts to get Yorktown back into action after the beating she suffered at Coral Sea) the Americans managed to commit three heavy carriers to the Japanese four off of Midway, and possessed forewarning of Japanese intentions in the area. Yet even this might not have been enough, given Japanese superiority in training and tactics. However, the Americans benefited from a surfeit of both bravery and luck on this day. Having located the Japanese force first, the Americans launched a steady progression of both land- and carrier-based attacks on the morning of the 4th. The penultimate strikes, by American carrier-based torpedo planes, were a dismal failure and led to the near-total annihilation of the US forces involved. However, they did succeed in drawing the Japanese fighters down to lower altitude, leaving the door open for a high-altitude dive bombing attack. And fortunately for the Americans, their dive-bombers, though poorly directed and low on fuel, managed to follow an outlying Japanese destroyer back to the main force. It was 1000 hours. The subsequent dive-bombing attack was one of the most effective of the war. Three Japanese carriers (Akagi, Kaga, and Soryu) were heavily hit and would later sink, despite strenuous damage control efforts. Hiryu, which avoided the morning bloodbath, managed to launch an afternoon attack which crippled the hard-hit Yorktown (she would be sunk soon thereafter by a Japanese submarine), but then she, too, was found and sunk later in the day. Kido Butai, the feared Japanese carrier striking force which had ranged across the Pacific and beaten its foes with near-impunity, had been destroyed at a stroke. For the Japanese Navy, this marked the end of any real strategic offensive capability. They would rebuild their air wings, and eventually replace their carriers, but they would never again possess a 'critical mass' of both large carriers and well-trained air groups. From now on, the war would be fought against the backdrop of an inexorable increase in US naval might, which might not be immediately deployable, but was demonstrably building. The Japanese, meanwhile, would find their strength increasingly on the wane. And the anvil of the Solomons, where the logistical and material backbone of Nihon Kaigun would be permanently and irrevocably broken, lay just ahead.